You thought, perhaps, that there was nothing fresh left to write about the Holocaust. Think, sadly, again. Edwin Black, a dedicated, even driven, researcher, has a new charge sheet to present. 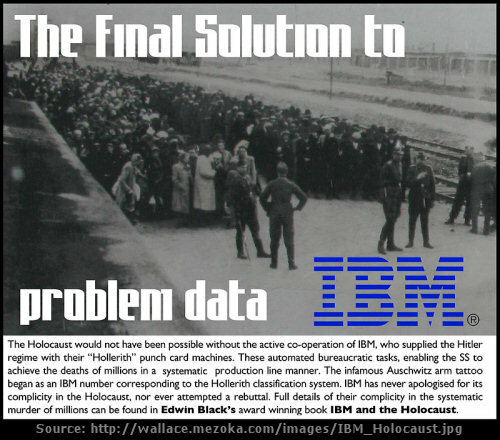 It shows, in compelling detail, that IBM, ‘the solutions company’, was also the company of the Final Solution. How did Hitler, from 1933 on, find, herd and exterminate millions of his Jewish victims with such sickening precision? Easy. IBM, through its German subsidiary, Dehomag, ran his censuses and surveys on its unique punch-card tabulators. It provided the vital infrastructure for persecution and the the silence of the gas chambers. What is more, it knew exactly what it was doing. Thomas Watson, the chief executive who built one of America’s greatest international enterprises, did not receive the Merit Cross of the German Eagle for nothing, but for services knowingly rendered. Watson is the villain of this piece. He was a classic American success story, the sewing-machine salesman who became corporate emperor, president of the International Chamber of Commerce and chum of FDR, but also a covert admirer of the Third Reich who peddled his hanging chads with fawning eagerness. There is no scope for doubt. Black has a relentless flow of memos, letters and speeches. When Watson wrote in 1937 (long after his punch cards had begun their whirring work) that the world ‘must extend a sympathetic understanding to the German people and their aims under the leadership of Adolf Hitler’, he had the clearest knowledge of what those aims entailed. As the war took hold, Watson found himself trapped between a PR rock and a ruthless hard place. He sent his medal back and disavowed his German clients, but he still kept the tabulators turning, still gathered the profits, was still on hand as the conflict ended to turn Dehomag into IBM Germany and go marching on. That, in a sense, is all you need to know. It is a distinctive contribution to the history of the time. It wholly justifies Black’s years of toil. At such a distance, however, the reader inevitably looks for understanding beyond the damning facts, for a more contemporary relevance to set multinational America wriggling uneasily in its chair. Such parallels are easy enough to construct. The facts (to reiterate) speak for themselves. Hitler would have had his Holocaust without IBM’s willing efforts, but it would have been a longer, less clinically efficient business. IBM helped the trains to his concentration camps run on time, spewed out the cards for slave labour and watched its stock-market majesty grow. It was the backbone of Auschwitz and Roosevelt’s first social security programme, a ‘service industry’ which existed to serve whoever paid the bill and not to make moral judgments until forced to confront them. By way of custom of international law, genocide, crimes against humanity, and war crimes are usually not subject to statute of limitations, nor to prescription. This custom has been codified in a number of multilateral treaties. States that ratify the Convention on the Non-Applicability of Statutory Limitations to War Crimes and Crimes Against Humanity agree to not allow limitations claims for these crimes. Article 29 of the Rome Statute of the International Criminal Court states that genocide, crimes against humanity, and war crimes “shall not be subject to any statute of limitations”.